This page contains interesting and provocative bits of history that you may have seen at some point in time but forgotten where you initially came across it. Click on the link to read the article . . .
Jari A. Villanueva, jvmusic@erols.com is a bugler and bugle historian. A graduate of the Peabody Conservatory and Kent State University, he was the curator of the Taps Bugle Exhibit http://www.arlingtoncemetery.com/tapsproj.htm at Arlington National Cemetery from 1999-2002. He has been a member of the United States Air Force Band since 1985 and is considered the country's foremost authority on the bugle call of Taps. Five signers were captured by the British as traitors, and tortured before they died. Twelve had their homes ransacked and burned. Two lost their sons serving in the Revolutionary Army; another had two sons captured. Nine of the 56 fought and died from wounds or hardships of the Revolutionary War. They signed and they pledged their lives, their fortunes, and their sacred honor. What kind of men were they? Twenty-four were lawyers and jurists. Eleven were merchants, nine were farmers and large plantation owners; men of means and well educated. They signed the Declaration of Independence knowing full well that the penalty would be death if they were captured. Vandals or soldiers looted the properties of Dillery, Hall, Clymer, Walton, Gwinnett, Heyward, Ruttledge, and Middleton. At the battle of Yorktown, Thomas Nelson Jr., noted that the British General Cornwallis had taken over the Nelson home for his headquarters. He quietly urged General George Washington to open fire. The home was destroyed, and Nelson died bankrupt. Francis Lewis had his home and properties destroyed ... The enemy jailed his wife, and she died within a few months. They gave you and me a free and independent America. The history books never told you a lot about what happened in the Revolutionary War. We didn't fight just the British. We were British subjects at that time and we fought our own government! Some of us take these liberties so much for granted, but we shouldn't. So, take a few minutes while enjoying your 4th of July holiday and silently thank these patriots. It's not much to ask for the price they paid. NEW YORK - Beneath twin marble gravestones in the Green-Wood Cemetery lie the Prentiss brothers, buried along with their 135-year-old tale of sibling love and hate. The Baltimore natives fought on oppo- site sides in the Civil War, each convinced their cause was just. Their house divided only was healed during a battlefield reunion after both were badly wounded in the 1865 siege of Petersburg, Va.
Each died within months, one in a Washington hospital, the other at a third brother's Brooklyn home. Dr. John Prentiss, a surgeon for the Union, interred his brothers side by side. Sitting in an office at Green-Wood, Jef- frey Richman recounts the saga of Clifton and William Prentiss. Their tale is one of dozens rediscovered since Richman mounted a search this year for the estimated 6,000 Civil War veterans buried inside the landmark cemetery. proaches to try to find as many of these veterans as possible." Like any detective, Richman stays busy chasing leads — some gleaned from ancient index cards and grave registries, others sent in by Civil War buffs or veterans' relatives. He's even perused 140-year-old box scores of baseball games played by soldiers on the cemetery grounds. Richman doesn't work alone. In May, 60 volunteers walked through the 478-acre cemetery in search of potential veterans' graves. A similar effort was undertaken in September, with 80 people turning out — including retired educator Susan Rudin. "My husband and I are interested in the history of ordinary people during extraordinary times," said Rudin, who is helping assemble biographies of the soldiers. "It makes history more alive." Johnson is one of several hundred positively identified Civil War veterans. Another is Louis Napoleon Stodder, Boston-bom but buried in Brooklyn. The Union soldier was at the wheel of the ironclad Monitor during its historic clash with the Merrimac; he suffered an injury when a Confederate shell struck its turret. Brau, who enlisted in the Union army at age 15, survived the war between the states, then returned home to don a tuxedo and run a dance studio. The cemetery is as much a New York institution as the Brooklyn Bridge or Central Park — and it predates both by decades. Founded in 1838, it gains residents at the rate of nine funerals per day. Joey" Gallo, and corrupt politician "Boss"
The new project has several goals: locating all the vets, getting them proper gravestones, and publishing a book about the Civil War through the lives of those buried in Green-Wood. 10 different people on the field that day," says Richman. "All New York guys, and all here at the cemetery." Carlton, killed during the fighting at Gettysburg's "railroad cut," and Gen. Henry Slocum, who survived the three days of bloody fighting to become one of Brooklyn's leading citizens. The cemetery plans to pick up the cost of the new headstones as part of the project. Any money generated by the book would be donated back to the cemetery to cover costs. Some stories are stranger than others. Col. J. Lafayette Riker, a balding, bearded officer, found himself facing court-martial for allegedly shacking up in his tent with a woman posing as an Army private. there was no happy ending: He died at the Battle of Fair Oaks, Va., on May 31,1862. This ought to boggle your mind -- I know it did mine! The year is 1902 ... a little more than one hundred years ago ... what a difference a century makes! Here are some of the U.S. statistics for 1902 . . .
Life expectancy in the U.S. was 47 years. Alabama, Mississippi, Iowa, and Tennessee were each more heavily populated than California. With a mere 1.4 million residents, California was only the 21st-most populous state in the Union. The tallest structure in the world was the Eiffel Tower. One in ten U.S. adults couldn't read or write. Only 6 percent of all Americans had graduated high school. 18 percent of households in the U.S. had at least one full-time servant or domestic. Just think what it will be like in another 100 years . . .
Population: 422 White and 55 Black/ Mulatto, all free in 83 households, eight of which were black households. Assets are in parentheses. Known Civil War soldiers are underlined. Names of Afro-Americans are in bold type. The Town was primarily a retail/ residential community. There were 23 Merchants, 12 clerks, one factor, five apprentices, and also 12 spinsters. Cornelius Goodwin ($0), F. E. N. Wills ($1400), and Arthur Pendleton ($0) were tailors. Elizabeth Stephenson ($0), C. F. Vallentine ($0) & Lucy Adams ($0) were milliners. James H. Whitehead ($250) and John F. Ranson ($400) were boot and shoemakers. There were only 11 Servants listed, all black, all living with seven of the 75 White households. Free Afro-American households were Ann Gross ($0), Amanda Joyner ($0), Mary A. Scott ($40), Doris Hardy ($0), Robert Bailey ($20), Benjamin Gardner ($40), Martha Holliway ($0), and Lizzy Harris ($20). James P. Holliway ($800), R. T. Edwards ($350), Wiloughly Riggin ($100), F. A. B. Watson ($3000), Wm. M. Moody ($0), John W. Parr ($100), William J. White ($0), and Phinias Parr ($0) were Carpenters. Wm. ($0) was a fisherman. Ironically, Jordan ($0) was a seaman, though his father ($51470) was very wealthy. Manufacturers: Isaac D. Cofer ($700), Madison M. Crocker ($1150), A. W. Layman ($500), & R. F.
Herring ($50) were saddlers- makers of furnishings for horses. George Murry was a watchmaker ($150). Managers: Edwin Morrison ($12900) managed one of the two hotels in Smithfield, Soloman J. Wilson ($45000) managed saw & gristmills, & James Scott ($6500) managed the cotton gin on Scott’s Factory Rd. George Wilson ($35355), Octavius Goodrich ($20950), Wm. H. Day ($30000), T. F. P. P. Cowper ($19200), Willis Wilson ($47000), James N. Atkinson ($31000), and Archibald Atkinson ($91100) were listed as Farmers. Archibald Atkinson had been a United States Congressman, and also owned the old customhouse in Battery Park, Virginia. Cowper had recently moved from Ragged Islands to the old 1750 Courthouse/ Butler House. James B. Southall ($19000), John R. Purdie ($2950), and William D. Southall ($11500) were Physicians, and C. C. Chalmers ($9500)was the Drugist. Cornelia Lightfoot ($0), Julia Field ($500), and Mary Scott ($0) were Schoolteachers, and Anna Scott ($0) was the Music Teacher. Robt. H. Whitfield ($57000), J. S. Wilson ($2000), and C. B. Hayden ($21625) were Lawyers. John A Jordan was the Deputy Marshall ($3000), and Benjamin Bidgood ($300) was the Postmaster. Archibald Atkinson, C. B. Hayden, S. Junius Wilson, and John Robinson Purdie, the town’s most distinguished citizens, were the first Mayors of Smithfield from 1852 - 1866. Joseph E. Potts ($0) and Patrick Robert ($4200) were the Methodist and Episcopal Clergymen respectively. Mallory T. Dickson ($12000) and George W. Purdie ($300) were listed as Gentlemen, both were 46 years old. The most affluent were the merchants, farmers, and lawyers: John E. Adams ($92700), Archibald Atkinson ($91100), Robt. H. Whitfield ($57000), James Thomas ($56930), and Wm. H. Jordan ($51470). Many of those with respectable employment were poor. The oldest residents were Elizabeth Ponsonby, 92 years old, and Doris Hardy, 83 years old. A cursory review of the 1860 Slave Schedule suggests Smithfield residents could have owned 200 to 300 slaves. The Battle of Smithfield (Monday, February 1, 1864) was a much broader action than is generally related, ranging from the Nansemond River, Chuckatuck Creek, Scott’s Factory Road, Smithfield, Pagan Creek, Forts Boykin and Huger, and Ivor. It is involved at least five U.S. gunboats, three army gunboats, one transport, and two armed launches, virtually the whole Hampton Roads armada at that time. Under acting United States Rear Admiral Samuel P. Lee, grandson of Richard Henry Lee, General Graham aboard the transport Long Branch accompanied by the army gunboats Flora Temple and the General Jesup proceeded from Newport News toward Jamestown in search of a south side Rebel force. The Long Branch landed 90 soldiers, consisting of a howitzer squad, 20 cavalry, and various infantry, at Smithfield at 1:25 P.M. on Sunday, January 31, 1864. They were to advance toward Chuckatuck where it was believed there was a Confederate force. At 3:00 P.M. Branch ordered the Flora Temple up Chuckatuck Creek to occupy the attention of the Confederates at Chuckatuck. The gunboat U.S.S. Commodore Morris and the army gunboat Smith Briggs were ordered up the Nansemond River to land troops at Holladay Point with orders to proceed to Chuckatuck Village. Thus was initiated a pincer movement. Meanwhile, the Flora Temple went aground in Chuckatuck Creek, the Long Branch and General Jesup coming to her assistance and eventually dislodging her. These three vessels retired to the mouth of the Chuckatuck Creek by early nightfall and were in the Nansemond River by 8:00 P.M. Conditions were very foggy. By this time the U.S. infantry that had been originally landed at Smithfield under Federal Captain John C. Lee, Company I, 99th New York, had retired toward Smithfield (8:00 P.M.) pursued by Confederate soldiers. General Graham, contacted by the U.S.S. Commodore Barney, ordered at 4:00 A.M., February 1, 1864, the Smith Briggs to Smithfield. Conditions were still very foggy. The Flora Temple and General Jesup had already been ordered to proceed up Chuckatuck Creek at daylight with the same purpose as before as a distraction. Graham’s infantry expedition to Chuckatuck from the Nansemond River was renewed at 7:00 A.M, February 1, 1864. At 11:30 A.M. the Smith Briggs met the U.S.S. Shokokan off the mouth of the Pagan River. Two armed launches from the U.S.S. Minnesota, Admiral Lee’s flagship, had been put under tow by the Shokokan, which proceeded up the Pagan River. When they could go no further because of the Shokokan’s draft, the Smith Briggs with these same two armed launches, each with 23 men, proceeded to Smithfield. The Smith Briggs arriving too late was captured. Federal losses were two wounded, 17 killed, and 144 captured. One Confederate was killed. The Commodore Morris reported that the Smith Briggs’ magazine blew up at 3:50 P.M, it thereby sinking. The U.S.S. Commodore Jones, searching for survivors, reported February 6, 1864 that Richmond had ordered Sturdevant’s Confederate troops at Ivor to proceed toward Smithfield. Apparently, the Confederate Signal Corps at Fort Boykin or Fort Huger had picked up on Federal movements and had relayed the information up the James River to Richmond. Union Private John Lyman of the 152nd Regiment Volunteers, 3rd Pennsylvania Heavy Artillery, rescued by the Commodore Jones inshore at Day’s Neck, reported Sturdevant had 500 men, which included 40 cavalry. Thus, the Battle of Smithfield was an extensive operation. As an aftermath, on March 31, 1864, at 4:00 A. M. union troops under acting Master Wilder captured a signal corps of 20 confederates up Chuckatuck Creek at Cherry Grove in Isle of Wight County, probably the original object of the January 31, 1864 expedition. The captured were taken aboard the U. S. S. Commodore Barney. * 1860 Census for Smithfield- Population 477. Free Negroes & Slaves. Mother Howard. * Actions on Chuckatuck Creek. General Pickett, Local Soldiers. The Isle of Wight Rifle Grays & the Isle of Wight Avengers, i.e. In April 1861, the men of Windsor organized the Isle of Wight Rifle Grays under Captain Meredith H. Watkins. It included the six Robert brothers, all of whom survived the war. By July 1861 the Grays were accepted into the Confederate Army as Company D, 16th Virginia Regiment under VMI graduate Colonel Raleigh Colston. Colston’s command was scattered from the Fairgrounds, Camp Withers, and Huger Barracks, all in Norfolk, to Craney Island and Sewell’s Point. On December 24, 1861 Colston was promoted to Brigadier General. Hence, by the spring of 1862, Colonel Charles Crump & Lt. Colonel Joseph H. Ham were elected to command the 16th Virginia, Captain George Hines Jordan & 1st Lieutenant William S. Chapman now commanding the Grays. The City of Norfolk, its position no longer tenable, was abandoned in May 1862, and the 16th Virginia and Company D were transported to Gordonsville in Orange County, as a reserve for General Lawrence Branch’s North Carolina brigade. On June 4, 1862, near Richmond, the 16th Virginia was attached to William Mahone’s brigade, with which it would remain for the rest of the war. The 16th Virginia participated in the Seven Days Battles at Richmond including Malvern Hill, Stephen A. Eley becoming 2nd Lieutenant of the Grays. At Second Manassas, the last words of the wounded Colonel Crumpwere “Come on, boys, I am with you till the last!”, but he was hit a second time and killed. Brigadier General Mahone and Lt. Colonel Ham were also wounded. Major Richard Whitehead then assumed command of the 16th Virginia, Ham and Whitehead alternating command through the rest of the war, depending on who was fit for duty. The 16th Virginia Regiment in September 1862 would tie down General William B. Franklin’s whole Union Corps at Crampton’s Gap for hours, saving Stonewall Jackson’s operation at Harper’s Ferry and allowing General Lee opportunity to concentrate his army for the Battle of Antietam. This action was one of the great stories of heroism in the Civil War. The Isle of Wight Grays and the rest of the 16th Virginia would now join the Isle of Wight Avengers and the rest of their 61st Virginia Regiment at Fredericksburg. Most of the Avengers had enlisted at Beaverdam Church in Isle of Wight County. Under Captain William E. Barnes and 1st Lieutenant William H. Powell the Avengers had been stationed at the Forrest Entrenchment Camp near Portsmouth in 1861 and had moved under Captain Joseph H. Holland and 1st Lieutenant William H. Lawrence to Petersburg and Fort Darling in May 1862. By August 1862 the 61st Virginia guarded Richmond and constructed bridges. Most importantly, in November 1862 the 61st Virginia acting alone was the vanguard of Lee’s Army at Fredericksburg, keeping Burnside from crossing the Rappahannock. There the Isle of Wight Avengers & the rest of the 61st Virginia would become attached to Mahone’s brigade and their fellow Isle of Wight Grays, fighting at Fredericksburg, Chancellorsville and Gettysburg. By 1864 this brigade of Mahone’s had a reputation as being one of the best disciplined in the Army of Northern Virginia. Furloughs were low, even for officers. There were religious services and grammar classes. Mahone even created an elite battalion of five 38-man companies of his best sharpshooters. With two long-range, globe-sighted rifles they could hit targets at 1000 yards. The 61st & 16th Virginia were present at one of the dramatic incidents of the war. On May 6, 1864, at the Battle of the Wilderness, Mahone’s brigade, now under Colonel Weisiger, attacked Union General Winfield Hancock’s Corps on its left flank. Generals James Longstreet & Micah Jenkins, reconnoitering Hancock’s position, were seriously wounded possibly by the Isle of Wight Avengers or Grays. Longstreet was Lee’s most trusted Lieutenant after Stonewall Jackson, who was wounded in similar manner by his own men. Jenkins later died. On July 30th, 1864, Major General Mahone’s division, including 61st & 16th Virginia, defeated Union forces, just southeast of Petersburg, at the Battle of the Crater in vicious and terrible hand-to-hand fighting, causing 4000 Union casualties. This action was the first that exploded underground mines on a large scale. The Confederate government commemorated the special gallantry of the 16th Virginia, which captured fifteen stands of colors, by placing seven of their names on the Roll of Honor. The Grays’ Corporal Solomon V. Butler, who enlisted at Windsor, was so honored. On October 27, 1864, 61st and 16th Virginia helped defeat Union forces at Burgess’s Mill, southwest of Petersburg. This action kept open for an additional five months the South Side Railroad from Lynchburg to Petersburg, thus saving Lee’s supply line for the winter of 1864 - 1865. On April 3, 1865, with Lee in retreat, Mahone’s division and the 61st & 16th Regiments left the Petersburg siege lines for the last time, forming the rear guard of the Army of Northern Virginia. At the Appomattox Courthouse surrender, Mahone’s division was the most intact of Lee’s divisions and one of the few units Lee could have called upon to repel their adversary. This cohesion in terrible circumstances can be attributed to Mahone’s discipline. Thus the 61st & 16th regiments and their other compatriots from Mahone’s old brigade were the inspiration of Freeman’s great biographies of Lee & his Lieutenants. In April 1861 the Smithfield Light Artillery Blues was formed under the command of Captain James F. Chalmer. Dr. William D. Southall of Smithfield was their physician. By June they were ordered to Old Town Point at Portsmouth, remaining there until the Spring of 1862. On June 21, 1862 they became part of the 19th Battalion, Virginia Heavy Artillery under the command of Major J. Wilder Atkinson and were stationed at the Richmond perimeter, part of the 19th Battalion participating in the fighting at Savage Station. In general command of all Richmond artillery was Colonel Thomas Smith Rhett. . In August 1862, the 10th and 19th Battalions were assigned to Battery Number 2, southeast of Richmond, and would remain sister battalions throughout the war, Major William Allen of Surry first commanding 10th Battalion. There they established a hospital. Soon after the 19th Battalions was moved to Battery Number 8, one mile north of Richmond, and built another hospital. In November 1862 the 19th Battalion had 390 men almost half reporting sick. Work progressed on the Richmond fortifications with guns coming from the Tredegar Iron Works. The Heavy Artillery would become very active in 1864. First, on February 4, 1864 thirty men were reassigned from the 10th and 19th Battalions to the Confederate Engineer Regiment. On the 20th, Captain Chalmers of Smithfield was ordered to exchange his Springfield muskets for an equal number of Mississippi Rifles. On March 1, 1864, 19th Battalion was ordered to proceed immediately to the intersection of the intermediate lines with the Brooke Turnpike with rations on hand and 30 rounds of ammunition in their cartridge boxes. The movement was in response to the Kilpatrick-Dahlgren raid on Richmond. Afterwards, Colonel Stevens reported that the artillery had been “handled exceedingly well”. In May 1864, the 10th & 19th Battalions were shuffled around to meet the rumored advances of Union General Benjamin Butler. In late May 1864 Confederate Colonel Archer Anderson in his inspection of Richmond artillery defenses stated “As infantry, imperfect . . . : as heavy artillery good.” However, more drills were ordered, and part of 19th Battalion was ordered to the Mechanicsville Turnpike and the Intermediate Lines. Also, the battery on the Williamsburg Road was transferred from the 19th Battalion to the 10th Battalion. In June, with Grant beginning to lay seige to Petersburg, portions of the 10th and 19th Battalions Heavy artillery were ordered to the Mill and Varina roads and to the exterior lines around the New Market road. On July 30, 1864, below Petersburg, was fought the Battle of the Crater, which caused much excitement among the heavy artillery. The 19th Battalion was issued two Coehorn mortars in August, which they placed between the Central Railroad and the Meadow Bridge Road. In November 1864, 19th Battalion was at Battery Number One, just southeast of Richmond. On January 1, 1865 the heavy artillerists were scattered and they were no longer acting as a unit. On January 9, 1865 the Heavy Artillery and Reserves were organized into one brigade under Lieutenant Colonel John C. Pemberton, who commanded as Lieutenant General at the surrender of Vicksburg. After exchange he had resigned his commission, but, remarkably, in 1864 accepted the rank of lieutenant colonel with command of the artillery defenses at Richmond. Pemberton’s four heavy artillery battalions had a strength of 1002 men. Also, Colonel Stapleton Crutchfield assumed command of the Chaffin’s Bluff Artillery Brigade, to which the 19th Battalion would soon transfer. With Major Cary on leave Captain Chalmers of Smithfield took temporary command of the 19th Battalion. On January 29, 1865 the 19th Battalion was ordered to abandon the intermediate Lines and report the next day to Chaffin’s Farm, east of Drewry’s Bluff. In the first two months of 1865 more than half of Pemberton’s cannoneers deserted, died, or had been reassigned. Such was the decline of the Confederacy. The 10th and 19th Battalions remained at their positions in the Richmond defensive line and at Chaffin’s Bluff with little movement until Richmond was evacuated on April 2, 1865. Night blindness was becoming a problem due to the lack of nutrition. “. . . Their infantry then appeared in solid line. They moved steadily forward, reached the creek [Sailor’s Creek] which we had so recently crossed, waded through as we had done, dressed up their line, and continued their advance to within thirty or forty paces of our line, the order was given to charge. In a moment we were on our feet yelling like demons and rushing upon their line. It has always been a mystery to me why they did not then and there wipe our little band from the face of the earth. It may be that the very audacity of our charge bewildered and demoralized them. At any rate they broke and fled just before we reached them. . .
. . . Crutchfield was killed, and Adjutant Wilson shot through the leg, which had to be amputated. I received a slight wound in the shoulder, which, however, did not incapacitate me. After the enemy had retreated across the creek, we gathered up our handful of men and fell back to our original positions. . . A young cavalry officer riding in among us, begged us to surrender, telling us that we were entirely surrounded, and that further resistance was useless. It was so gallant an act no one attempted to molest him. The original Smithfield Light Artillery Blues lost at least twelve soldiers, killed, wounded, and captured at Sailor’s Creek, including 2nd Lieutenants William Folk and Francis Watson, both of Smithfield, and John Jordan, Deputy Marshall of Smithfield in 1860. The Army of Northern Virginia and a Blues’ remnant finall y surrendered April 9, 1865 at Appomattox Courthouse. The Official Military Atlas of the Civil War, Plate 77, Smithfield Library, Smithfield, Va.
“The Masonic Lodge No. 18 in Smithfield has on file among its records a diary of Dr. John Robinson Purdie kept from November 10, 1860 to April 28, 1865. This is an account of one man’s anguish at the secession of the slave states from the United States. Dr. John R. Purdie was the son of Dr. John Hyndman Purdie and the great-grandson of George Purdie who came to Smithfield as early as 1753 from Dumbarton, Scotland. During the Civil War Dr. Purdie served as mayor of Smithfield for two years. He was an outstanding Mason, having served as Grand Master of the Lodge of Virginia for two terms. He was known as Smithfield’s early historian. My mind is continually haunted by the specter of dissension. The question constantly arises; what shall we accomplish by secession? Will it secure the repeal of the “Personal Liberty Bills?” Will it prevent private combinations, secret missions, incendiary publications? Will it enable us to recover our slave after he reaches the North? Should a master be so bold as to pursue his fugitive into the territory of our northern neighbor (then foreign) will his being a citizen of a southern confederacy procure him any facilities for assisting and possessing his property? Will this political remedy, secession this political panacea prevent Jno Brown raids or suppress Captain Montgomery practices? What does experience teach: from among the many thousands of fugitive slaves that have escaped to Canada, has one ever been recovered? . . . If by the merest possibility, a treaty could be negotiated for the restoration of fugitive slaves, it is very certain named evils would not be thus prevented. But we have no treaty for the rendition of fugitive, with any nation. Our nearest neighbors have not yielded on that point –Great Britain, Spain, Mexico, France and Holland have colonial possessions near us but so far as my acquaintance with diplomacy extends, we can claim no fugitive slaves under our treaties with them. Then he must be a credulous visionary indeed, who can hope for such an arrangement with our northern neighbors when our proposed new republic has taken her place in the family of nations. If on this very question, the United States should permit the federal compact to be dissolved rather than yield it, would dissension and the formation of a slave republic on her southern border, make the United States government more practicable towards the restoration of fugitive slaves? Then, there is but one other resort among nations for the redress of grievances; reprisals with inevitable result, war – the impressible conflict would then begin, if it is not now already progressing . . . There are about 200,000 voters in Virginia, of whom only 35,000 are owners of slaves. Do you suppose the 165,000 non-slave holders are so destitute of knowledge and penetration, as not to discern when reason and calm reflection assert themselves, that secession, civil war, standing armies, onerous taxation, destruction of trade, commerce and manufacturing (which are the legitimate precursors of pauperism, starvation and death) have been inflicted on them only to foster the slave interest? . . . From what I have hastily set forth, you must plainly discern that I am opposed to secession: nor will I vote on one who advocates it for the causes now existing. 1st—What complaints of the South against the North will secession remove? 2nd—Will secession annul the election of A. Lincoln? 3rd –Will it cause Black Republicans to love and respect us? 4th –Will it prevent the escape of our slaves? 5th –Will it facilitate their recovery from the Northern States? 6th –Will it repeal the Personal Liberty bills which Jonson, a Senator from Georgia, asserts “have not operated to prevent the execution of the Fugitive Slave Laws”? 7th –Will it insure the execution of the Fugitive Slave laws, which Mr. Rhett & other statesmen of South Carolina have pronounced palpably “unconstitutional”? 8th –Will it secure protection to slaves in the territories? 9th –Will it widen our vicinity with an anti-slave country? 10th –Will it prevent hostile incursions into slave states? 11th –Will it diminish the expenses of government or lessen the taxes on the people? 12 –Will secession promote the interests of our people? “If these twelve questions cannot be answered affirmatively, what will secession accomplish?” Dr. Purdie wrote. Dr. Purdie left the twelve questions displayed in the Smithfield Post Office until the Virginia Convention passed the Ordinance of Secession. Then he took the questions down and filed them away. He was a native Virginian and was determined to go with his state with heart, mind, and body. At this time in the history of our country there was no political doctrine more univerally accepted by the southern people than that of “State Sovereignty”. Reference: Historical Notes on Isle of Wight County, Virginia , Donning and Company, Virginia Beach, Virginia, 1993, Chapter 9, Helen Haverty King. On a hot August day in 1861, the Fourteenth Regiment North Carolina Volunteers arrived in Isle of Wight County, having marched some twenty-three miles from Suffolk. they established a camp near Bidgood’s Church (now Bethany United Methodist) on what is now Bethany Church Road. The camp occupied both sides of the highway, officers’ tents on one side and companies’ tents on the other. One member of the regiment commented: “It was an ideal camping ground, in a high level sandy country.” these Carolina boys were from counties across the state including Anson County on the South Carolina border, Buncombe in the west near Asheville, and Halifax County in the east near Roanoke Rapids. They remained in the camp for eight months, leaving in April of 1862 to cross over the James River to support General Magruder and his army on the Peninsula. To provide an idea of the size of this body of men, a regiment consisted of ten companies. Each of these companies employed up to one hundred men. The required complement of officers and men would probably exceed one thousand. Early in the Civil War these companies were generally full, which was not the case as the conflict wore on. Remaining in Isle of Wight through the winter months would require the regiment to construct more substantial, weatherproof quarters to protect against the elements. “October came and the weather became pinching, which admonished us that winter quarters were in order.” The officers selected a site nearby, some ten acres in size, to contain the quarters and parade ground soon to be named “Fort Bee”. The men set to work constructing log barracks with “stick and mud” chimneys using the abundant pine trees in the area. Evidence of this camp can be seen in the area. It is possible to walk all four sides using the mounds as a guide. Pits, probably used as wells, are also still visible. Camp life at times could become mundane. However, these boys were very proud of their new home and on special occasions encouraged civilians to visit. These included some of the officers’ wives as well as the local folk. There were junkets to Mr. Wrenn’s place on Burwell’s Bay for peach brandy, for which the men developed a fondness. The Fourteenth Regiment had a picket post at the mouth of Tormentor Creek, where it emptied into Burwell’s Bay. This post was located on what is now Dr. Wendell Pile’s property. Each company was required to spend a week on guard duty at that location. While there the men were given fish and oysters in abundance by the local Negroes working their boats in the water around Fort Boykin. Evidently the watermen felt some measure of protection because of the guns in the fort. Little did they realize the hardships to come and how they would long for the comfort of camp life they had enjoyed at “Fort Bee”. Note: Brigadier General Bernard Bee was killed at the Battle of First Manassas. He was famous for giving Stonewall Jackson his epithet by saying in the height of battle “There stands Jackson like a stonewall”. This interpretative 2007 – 2008 text for Fort Boykin is intended to compliment the older signage already there, though not altogether consistent with that signage. The text is a continuation of the Fort Huger 2007 interpretative text. This signage may be added in 2009 or 2010. Brochures should include a map of the fort so tourist can identify and find the fort’s features during the walking tour. Hopefully, the traverses on the river bank and gun positions at the angles can be cleaned up and grass established. Curtains need to be cut back to their ivy cover as a new generation of saplings are growing along their edges. Large trees and ornamental plantings should be left untouched. Five signs now would greatly help the interpretation of the fort rather than wait a year or two to do a kiosk and 12 – 15 signs. An 1861 State flag, flag pole, benches, and three heavy guns, one from each type at the fort, might be added to the fort. The work could be done in phases. KIOSK—PEMBERTON, COLSTON, PRYOR, LANIER, HANKINS* with pictures. Must obtain original 1861 Fort Boykin map. AND SURRY SLAVES THAT WORKED ON THE FORT. SHOT FURNACE AND SKETCH OF PARAPET FEATURES. The American Civil War brought conflict directly to those living along the James River’s south shore in Isle of Wight County. A deep navigable channel just off shore at Hardy’s Bluff and Fort Boykin made these strategic military positions. These sites controlled river transportation and, therefore, access to Richmond. Hence, the struggle for their control by Confederate and Union forces. There were four naval assaults or actions against these forts in May 1862 with 100 – 400 Confederate soldiers defending against ships and sailors of the Union James River Blockading Squadron. Forts Huger and Boykin were part of Confederate General John Bankhead Magruder’s defense line facing Federal forces using Fort Monroe at Old Point Comfort as their base of operations. Begun in July 1861, this series of trenches, other earthworks and forts extended from Gloucester Point on the left, southwest across the Virginia Peninsula and across the James River here to Forts Huger and Boykin. This defensive line was established to effectively block the peninsula land approach to the Confederate Capital in Richmond and to close the York and James Rivers as supply routes for the Union armies. These considerable defenses held until May 4, 1862 when General Magruder abandoned the line in the face of overwhelming siege forces brought to bear by Union Major General George Brinton McClellan. With the land route cleared, Federal forces focused on the Confederate forts blocking the James River. Union warships then trained their guns on Fort Boykin to the south and Fort Huger. Despite accurate cannon fire from these forts, they were no match for the heavy enemy shelling in May 1862 from ironclads and other warships of the Federal fleet. The bombardments convinced southern forces that these forts were untenable, and they were abandoned. U.S. Marines landed and occupied Forts Huger and Boykin on the 17th and 18th of May respectively to find most of the guns “spiked,” the carriages burned and structures within the forts destroyed. This “reduction” of Forts Huger and Boykin opened the James River to the Union fleet for the next 50 miles up to the strong Confederate position at Drewry’s Bluff eight miles southeast of Richmond. Although southern land forces continued to operate freely within the interior of Isle of Wight County, Forts Boykin and Huger never again impeded the Federal advance to Richmond. Locally, John Pemberton was brigade commander of 3rd Virginia, 13th North Carolina, and 14th North Carolina regiments in late 1861. These regiments were under Colonels Roger Pryor, William Pender, and Junius Daniel, respectively. Pemberton’s headquarters was in Smithfield, Virginia. John Pemberton of Pennsylvania graduated from West Point in 1837. He was made first lieutenant in 1842 and served under General Worth in the Mexican War, being breveted captain for conspicuous bravery at Monterey. At the outbreak of the Civil War he resigned his commission and entered the Confederate army. He engaged in organizing the artillery and cavalry of the State of Virginia, in which task he was eminently successful. In February 1862 he was promoted to major general with command of the department of South Carolina, Georgia, and Florida and in the same year was promoted lieutenant general. In 1863 he succeeded General Van Dorn and took command of Vicksburg, which surrendered to General Grant on July 4, 1863. After exchange he resigned his commission, but in 1864 accepted the rank of lieutenant colonel with command of the artillery defenses at Richmond. After the war his life was spent in retirement in Virginia and later in Pennsylvania. On December 24, 1861 Raleigh Colston was promoted to Brigadier General, assuming General John Pemberton’s command at Smithfield, Virginia. Colston was born in Paris and was adopted by a Virginia physician. He was a graduate of VMI and became a French professor there. Colston watched the Battle between the Monitor and C.S.S Virginia, March 8, 1862, from the Ragged Islands in Isle of Wight. He commanded a brigade, which included 3rd Virginia Regiment, at Seven Pines, and he and General Rodes commanded the lead divisions of Stonewall Jackson’s overwhelming attack at Chancellorsville. After the war he was master of a military school in North Carolina. Later he accepted a commission in the army of the Egyptian Khedive. Returning to the United States, he took a minor position in the War Department. He died in poverty. Colonel Roger Pryor’s 3rd Virginia Regiment guarded Fort Boykin from July 1861 to April 1862. Pryor was commissioned a colonel in the volunteer forces of Virginia, May 3, 1861. He graduated from Hampden-Sidney College and studied law at the University of Virginia. He was associated with various newspapers and was editor of The South, an ultra-secessionist newspaper in Washington. In 1859 he was elected to the United States House of Representatives and in 1861 was elected to the Provisional Congress of the Confederate States. On May 23, 1861, the Ordinance of Secession was submitted to the vote of the people of Virginia. Union sentiment was strong in Portsmouth. The first fifteen men of Portsmouth’s Marion Rifles, as they appeared on the Rifles’ roll, were allowed to go to the Courthouse to vote. When it was discovered that fourteen had voted against secession, Pryor, present in Portsmouth, refused to let any more from the company go in town to vote. Pryor moved his command to Camp Huger near Zuni Station on June 7, 1861 and then to Day’s Neck and Fort Boykin on the James River about six miles from Smithfield on July 2, 1861. He commanded 11 companies of the 3rd Virginia Regiment of Infantry at nearby Camp Cook and Camp Pemberton, including the Surry Light Artillery and Isle of Wight’s James River Heavy Artillery. Later, he would become a Brigadier General, eventually commanding 3rd Virginia Regiment again at Gaines Mill, Frayser’s Farm, 2nd Manassas, and Antietam. He would resign and join as a private, Company E, 3rd Regiment, Virginia Cavalry, and would become a scout of noteworthy reputation. General James Kemper then commanded 3rd Virginia Regiment at Fredericksburg, Suffolk, and Gettysburg. After the war Pryor went to New York City and spent the remainder of his life there as a jurist, capping his career with his appointment to the New York State Supreme Court in 1894. Sidney Lanier (2nd Battalion, Macon Volunteers) was stationed at Norfolk in 1861-1862. From May 1863 to October 1864, he was stationed at Burwell’s Bay with the signal corps. He became one of the great poets of the South, his early poetry singing the beauty of the nights at Burwell’s Bay. Without instruction he learned to play the guitar, piano, violin, and flute. “In his hands the flute was transformed into a voice that set heavenly harmonies into vibration” At 14 he entered Oglethorpe College, Georgia and graduated with distinction. Years later, he was lecturer on English literature at John Hopkins University. Do you remember the “Brown Bird” in the Drama of Exile by Elizabeth Barrett, whose song as he sat on his tree in Paradise was the last sound heard by Adam as he fled with Eve, “along the glare”? So, O Friend, do I send my cry for you across these broad stretches of moonlight that lie between us. “Thou most rare brown Bird on thine Eden-tree, “O, never was a night so dark as I! And Love’s sweet-pleading loneliness in thee. And light a heart that’s dark enough to die. And bloom, ere that one Winter passed. With this, they satisfy their rest. The letters of Sidney Colin Lanier (1842 - 1881) and Virginia Wilson Hankins (1843 - 1888) sometimes rise to great beauty. They always loved each other. She was in many ways a very practical woman to love poetry and a poet. She sold Bacon’s Castle in 1872 to provide for her brothers’ and sisters’ education and became a schoolteacher, learned in Latin, French, and German. The family moved to Richmond. She wrote poetry and an unpublished novel. She never married. She died December 24, 1888 and was buried at Hollywood Cemetery. “ If my Little One has longed for me, half as often as have I for her, in the days since I saw her, - - - she will certainly have no difficulty in pardoning this greeting of pure and deep Friend’s Love, which my heart irresistibly insists on sending her this morning. “ . . . . Shall I tell you how, each night, a dainty, white hand, with the sweet blue veins branching over it, presents itself to me in the darkness, and how, when I have seized it, and pressed it to my bosom and covered it with a thousand kisses, I whisper, “Good Night, Ginna,” – and then turn me to my sleep, content, as if I had said a prayer? Shall I speak to you of the thrill that comes to me with my salutation, “Good-Morning, Little One,” which I utter when I awake, and which then quivers and glitters like a drop of dew upon the unfolding flower of my life for all that day? Shall I describe to you how all the Stars at night seem to me Love-lights in a myriad brown eyes, that look down on me lovingly and softly, and into which I gaze until my soul fails and grows dim with an infinite, sad yearning to draw near you? Nor drag thee back into the night. Pain is proud and scorns to weep. The fair-faced stars seem wrinkled, old, And still breaks, if far from thine. Soldiers guarding here outside the fort were primarily from the Third Virginia Regiment. They were from the cities of Portsmouth and Petersburg and the counties of Norfolk, Dinwiddie, Southampton, Nansemond, Surry, Isle of Wight, and Halifax. From July 1861 to April 1862, the Third Virginia Regiment had two encampments, one at Camp Cook a half-mile to the east of Fort Boykin and a winter encampment at Camp Pemberton (Old Castle) about ¾ mile to the south of Fort Boykin. The Fourteenth North Carolina Regiment had an encampment at Camp Bee near Bidgood’s Church (Bethany Church) three miles west of Fort Boykin. Somewhere in the general area were the Thirteenth North Carolina Regiment, possibly stationed at St. Luke’s Church. These forces were in compliance with orders from Headquarters, Virginia Forces, Richmond, June 30, 1861, which directed that a sufficient force was needed for the protection of the battery being erected at Fort Boykin. These various infantry regiments and other cavalry and artillery units, up to 4000 men, were under the command of General John C. Pemberton later of Vicksburg fame, then General Raleigh Colston, all being under Major General Benjamin Huger. Inside Fort Boykin Lieutenant Poindexter commanded soldiers from 3rd Virginia in early July 1861 followed by Lieutenant Fitzgerald in mid-July. Fitzgerald created a stir in Richmond by the rude way he took command. He ordered ammunition from the magazines and fired several rounds. He left the guns loaded, and laborers would not work on the slopes in front of the guns. From August 5, 1861 to late November 1861, Captain Alexander Callcote, who lived three miles north of Antioch Church (Windsor), commanded the James River Heavy Artillery inside Fort Boykin. Late December or early January 1862, the Isle of Wight Blues and James River Heavy Artillery switched their stations at Barrett’s Point (Crittenden) and Fort Boykin, Captain Archibald Duck from Smithfield commanding the Blues inside Fort Boykin, replacing Callcote’s command. The Isle of Wight Blues were inside Fort Boykin during the heavy May 8, 1862 bombardment by Union gunboats, U.S.S Galena, Aroostock, and Port Royal. Most of the soldiers from the Heavy Artillery and the Blues were from Isle of Wight, enlisting at Isle of Wight Courthouse, Smithfield, Fort Boykin, Mills Swamp Church, or Barrett’s Point. Typically, soldiers arrived in the area at Windsor or Zuni station via railroad and would then march to their respective camps in Smithfield, Fort Boykin, and Fort Huger. They drilled or worked from 7:00 A.M. to 4 P.M. except for an hour at noon. Dress parade was from 4 P.M. to 6 P.M. daily. Soldiers would take turns standing Picket Guard. However, when there was too much sickness, Picket Guard could be every other night for six hours. The soldiers lived in tents and picturesque log huts. Rations were bacon, beef, rice, flour, and sugar, supplemented by wild game such as squirrels or raccoon, which the soldiers could find in the surrounding forest. Husksters sold vegetables, fruits, chickens, and eggs. Strong coffee was made in huge kettles on campfires. Cider and beer were sold in camp by sutlers, but no whiskey was allowed, though there were attempts to smuggle it inside in the barrels of muskets. However, there were few brawls, and most soldiers were “moral” men and maintained “good order and discipline”. Good humor was prevalent. The 1862 parapet and raised gun positions along the river bluff have eroded back into the fort and down the embankment. One could not have seen over the original parapet standing on the floor of the fort. There are ten partial traverses remaining along the river bluff. Traverses were mounds of dirt that protected the fort’s guns, magazines, and soldiers from enemy fire. There were six 32-pounders, probably mounted in embrasure, which means there was an opening in the parapet to allow the gun to fire, i.e. the gun did not fire over the parapet. There were six columbiad, eight inch guns, probably mounted “en barbette”, which means the guns were on a raised mound or terreplein and fired over the parapet, i.e. there was no opening in that section of the parapet. The soldiers would seek shelter in bombproofs during periods of heavy enemy fire. Bombproofs were large earthen enclosures usually below the ground with roofs of timber and sod. Gunpowder and shells were kept in brick magazines protected by traverses and ventilated to prevent premature explosion of stored shells and powder. Shot furnaces heated balls of shot for firing at enemy ships. Facing the Bay and counting from the right, the middle magazine is at the fourth traverse. The shot furnace was immediately behind the middle magazine, where the road is now. There are no traces of it left. Probably, the six, 32-pounders were immediately left and right of the fourth traverse. Probably, the 8”-columbiads occupied the other gun positions shown on the 1861 map of Fort Boykin. The 1861 map of Fort Boykin shows only one entrance at the far west side of the fort, where the pathway goes down to the beach. Apparently, the modern, vehicle entrance on the south side did not exist in 1862 and has destroyed a previous gun postion. Civil War came to southeastern Virginia with a vengeance. Union forces held “Fortress” Monroe throughout the war and it became the strategic base for early attempts by the North to take the Confederate Capital of Richmond. The large casemated masonry fort at Old Point Comfort is at the tip of the peninsula bounded by the York and James Rivers. After the dramatic but indecisive “clash of the ironclads” between the USS Monitor and the CSS Virginia in Hampton Roads, Union forces quickly captured Norfolk and the major Gosport naval base in Portsmouth. The CSS Virginia, drawing too much water to go to Richmond and its coal supply captured, was destroyed and “the world’s best natural harbor” was ceded to Northern forces. Southern forces remained, however, solidly in control of the James River from Ragged Island and Todd’s Battery in Isle of Wight County up to Fort Boykin and Fort Huger and then north across the river to the batteries on Mulberry Island. This prevented any successful campaign up the peninsula to take Richmond because the James River was the essential supply route for US Army forces operating there. Clearing, refurbishing, and construction to expand the colonial-era Fort Boykin, guarded by the 3rd Virginia Regiment, began June 30, 1861 on this high natural bluff overlooking the James River. Five 32-pounders were first able to fire from prepared positions in mid-July 1861. From this bluff, Fort Boykin’s guns could hit ships in the main channel. This channel trails toward the “Ghost Fleet” ships to your front. Confederate guns on Mulberry Island on the far shore could fire on Union ships attempting to use the shallower channel nearer the Newport News side of the river. Beginning in May 1862 Federal naval forces began a concerted riverine assault to “reduce” the Confederate forts along the James River. One by one, beginning with Forts Boykin and Huger, these heavy gun batteries on both banks of the river fell to the overwhelming firepower of the Union fleet. The decisively strong Confederate gun battery at Drewry’s Bluff prevented farther access up the James River. But eventually, in May 1864, Federal forces established a base near City Point (now Hopewell) Virginia. Operating from this base, General Grant besieged Petersburg and finally took Richmond in April 1865. The North Carolina and Georgia regiments and the 3rd Virginia Regiment minus the Surry Light Artillery crossed the James River in April 1862. These regiments would become part of General Magruder’s retreat up the Peninsula toward Richmond. Ordered by Abraham Lincoln, the first recorded assault by Union ships on this fort was at 8:00 A. M. on Thursday, May 8th, 1862. Under Commander John Rodgers of the famous Rodgers family, the USS Galena, an experimental ironclad, fired over 300 exploding shells from its Parrot rifles and Dahlgren smoothbore guns onto Fort Boykin. The bombardment lasted three hours. The Galena was close enough to this fort that the fuses on the projectiles were set to explode after only five seconds. This accomplished Rodger’s intention of “…disconcerting the aim of the rebels…” here at the fort and enabled the wooden ships USS Aroostook and Port Royal to “run by” in the direction of Richmond. The Galena then proceeded to engage Fort Huger higher up the river. Next, and as a result of the destruction of the CSS Virginia (formerly the USS Merrimac) by its’ own crew on 11 May, 1862, Flag Officer Goldsborough, aboard his flagship USS Minnesota of the James River Blockading Squadron, ordered another attack on Forts Boykin and Huger. The loss of the powerful CSS Virginia cleared the way for the little USS Monitor with its’ larger guns to join the fray. On Monday, May 12th, Fort Huger engaged the USS Naugatuck and the famed Monitor now commanded by Lieutenant Jeffers, however, with no success. Fort Boykin was silent and may have been unoccupied at this time. Confederate soldier Benjamin Washington Jones stated in Under the Stars and Bars that on Wednesday, May 14th, a fleet of seven or eight federal gunboats “…saluted Fort Boykin with a shell or two. As there were only a few militia at the place, the resistance was feeble, and the fleet passed on, and turned its attention to Harding’s Bluff . . . the men there made a stout resistance . . . for more than an hour.” The militia may have been the Smithfield Light Artillery Blues as it usually was constituted, mostly those too young and too old for the regular service. Fort Boykin was probably abandoned at this time. Federal forces landed May 17th & 18th at Forts Huger and Boykin respectively only to find, in the words of Flag Officer Goldsborough, “The guns were spiked, carriages burned, and magazines blown up…” with the result that “the James River is now open from its’ mouth up to …Drewery’s Bluff.” Union soldiers also found the “secession flag still flying” at both forts and hoisted American ensigns. Apparently, the main Confederate forces in the area now, the Isle of Wight Blues, Fort Huger soldiers, and the Surry Light Artillery, had abandoned, finally and for the last time, both forts sometime between May 14th and 17th, 1862, falling back to Zuni Station or Ivor, then marching north toward Petersburg. Only Major John P. Wilson, Jr.’s small guard from 5th Battalion of Virginia Volunteers and possibly the home guard Smithfield Light Artillery Blues remained. Fort Huger, Hardy’s Bluff, James River, May 8, 1862. Three of the enemy’s gunboats – two of them iron-clad – came up at eight o’clock this morning to Fort Boykin (commanded by Captain John U. Shivers) and opened fire, discharging about three hundred rounds of shell and rifle shot. The Fort, which had only five mounted guns, returned the fire until ten o’clock, when order were given to spike the guns and burn the quarters. A fine company of light artillery and infantry had started from Smithfield, Isle of Wight County, to participate in the fight, but learning that the above orders had been given, they returned. The three gunboats then moved up the river eight miles, to the fort on Hardy’s Bluff, and at eleven o’clock the guns at this Fort opened fire, which was returned by the boats continually until two o’clock. After firing over two hundred rounds of shell and rifle, they passed up the river out of range of the guns at the Fort, we having fired the first and last gun. Our flag waved gloriously throughout the engagement. Not a man was killed in the Fort, and only three were wounded. Capt. J. M. Maury, (captain of the Fort,) during the entire engagement of three hours and a half, was as cool and collected as if only performing the daily practising of his guns on the Fort; also, Captain A. J. Aiken, of the Varina artillery, and Capt. Branch, of White’s artillery, and their respective officers – all their names I did not learn; nor can too much praise be given to the men in each company, obeying every order from their officers bravely and cheerfully, as if they had faced a hundred battles instead of this their first battle. It would have pleased their friends to have witnessed how gallantly they fought. After the battle, Captain Maury caused the men to be drawn up in a line at the Fort, and stated if there was a man that did not wish to remain in the Fort and fight with him, to step out of the ranks, and he would allow him to leave the Fort and get out of the range of the guns. Not a man moved, not an eye quivered; but with one universal cry of “No! no! no! we will fight!” Can such men be conquered? Marines and naval forces of the U. S. S. Minnesota landed at an abandoned Fort Boykin on May 18, 1862 and surveyed the fort. “. . . The fort is an earthwork of very elaborate plan and great extent, displaying a prodigious amount of labor and good engineering skill in its projection. Its form or outline is a polygon of five unequal sides, with bastions at the angles. The front is the longest side, being on the river, and presents the indented or cremaillere line. . . The length of the front of this work is about 800 feet, and it is about the same in depth . . . It is surrounded with a deep ditch . . .The interior of the work is traversed in all directions with bombproof traverses on the flanks of the curtains, and the bombproof shelters, and the magazines, carefully finished with sods; It contains three magazines, one of which had been blown up when the work was evacuated; two bombproof shelters for troops, which would shield 500 men, a parade ground, and space for quarters, not many of which had been built, as the troops were supplied from an extensive enclosed camp about a mile in the rear in which I was informed a regiment had been quartered for the purpose of building this fort , and had worked on it daily from the middle of June, 1861, to the beginning of the present month. In evacuating this strong work, after the fight with our gunboats, the rebels burned the gun carriages and spiked the guns, having evidently, made the attempt to remove them, but being in too great haste. They blew up one of the magazines, destroyed the shot furnaces, and burned their camp in the rear, which was well provided with log houses and stockaded. We finished the work of destruction inside the fort by blowing up the other two magazines and burning some houses, and also the bombproofs. . . . This fort, although covering a great extent of ground, and having been built with great care, mounted but a comparatively small number of guns, thirteen being all that remained. Some had been removed; they were found some distance back on the road to Smithfield . . . The guns had all been mounted in barbette, and except one, which was mounted in the rear, had all been placed on the river front. Six were heavy 8 inch columbiads . . .Six others, double fortified navy 32s . . . One navy 42 pounder carronade, mounted in bastion to the rear, overlooking the camp. [Total,] 13 guns. Official Records of the Union and Confederate Navies in the War of the Rebellion, Series I, Volumes 6 & 7, Washington Government Printing Office, 1898. Letter dated May 19, 1862, written from the U.S.S. Minnesota, from Lieutenant John Watters to Commander A. Ludlow Case. The guns came from Fort Powhatan near Hopewell via the James River and from Norfolk via Zuni Station and the Norfolk to Petersburg railroad. The 42 pounder carronade probably was at the angle on the parade ground near the main entrance. Rock Wharf was just to the west of the fort near The Rocks, the home of General Francis Marshall Boykin, II. Army stores, bricks, and lumber came in from this long wharf. Fort Boykin, commenced June 30, 1861, was constructed under the orders of Captain T.M.R. Talcott, assisted by 2nd Lieutenant W.G. Turpin. In 2007 most of the parapets along the river bluff no longer exist, having eroded down the embankment. O, might such dreams forever linger! O, might the moments stay! Why comes so soon the day? Portsmouth’s Virginia Riflemen, 3rd Virginia Regiment, Company B, was made up of disbanded, Portsmouth soldiers of the pro-Union Marion Rifles. The ladies of Petersburg (Cockade Rifles, 3rd Virginia Regiment, Company E) presented the 3rd Virginia Regiment, September 24, 1861, at Camp Cook a blue silk state flag (1861) bearing the arms of Virginia on one side and Justice with the scales on the other. The Nansemond Rangers, 3rd Virginia Regiment, Company F, were stationed at Godwin’s Point (Rescue), Isle of Wight, June 30, 1861. Southampton’s Rough and Ready Guards, 3rd Virginia Regiment, Company G, were presented a flag described as being the Stars and Bars of the Confederacy on one side, and the state flag on the other. The flag was largely the work of Judy and Lucy Thomas, sisters of Major George Thomas, U. S. Army, all of Southampton County. Thomas, who sided with the Union and became a major general, was celebrated as the “Rock of Chickamauga”. The Guards were stationed at Stonehouse Wharf, today’s Tyler’s Beach. The Surry Light Artillery, 3rd Virginia Regiment, Company I, was stationed at Smithfield, Virginia at the Masonic Lodge and Trinity Church grounds, June 23, 1861. They were detached from 3rd Virginia after early April 1862 and operated as a local home guard until mid-May 1862. Locally, they would bring up the rear on the south side after the Confederate retreat up the Peninsula toward Richmond in May 1862. In May 1864, the Surry Light Artillery helped turn back Union General Butler’s host from its advances on Port Walthall on the Appomattox River and the second Drewry’s Bluff, saving Petersburg and Richmond from capture and “the Confederacy from ruin twelve months before the collapse of the Southern Republic”. Walter Wrenn enlisted June 23, 1861 at Smithfield in the James River Heavy Artillery, 3rd Virginia Regiment, Company K. He was born in Isle of Wight and was educated at Hanover Academy and the University of Virginia. He went abroad in 1858 and studied at the Universities of Paris, Dresden, and Berlin, returning home in 1860. He was elected 1st Lieutenant, Co. K. In April 1862 he was appointed Captain on General Pryor’s staff. He was sited for gallantry at Williamsburg. He was killed at Second Manassas, August 20, 1862, while charging with the 4th Alabama. His brother Fenton Wrenn was appointed Sergeant Major, 3rd Virginia Regiment, May 1862. Elected 2nd Lieutenant, 3rd Virginia Regiment, Company K, after Seven Pines he was wounded at Antietam in Sept. 1862. On furlough, he rejoined his regiment October 1862 and was killed at Gettysburg, July 3, 1863. Camp Cook was named after James Watkins Cook, an affluent planter, who owned the plantation east of Fort Boykin and plantations in Greensville, and Southampton counties and in Alabama. He knew Colonel Roger Pryor and Edmund Ruffin of Surry County before the War and all three were delegates to the Southern Convention at Montgomery. Supposedly Pryor was offered the “honor” of firing the first gun at Fort Sumter but declined in favor of Ruffin. Cook gave the Surry Light Artillery its first two field guns, being two old Revolutionary War vintage guns, which they used in practice. The Greer family bought an overgrown Fort Boykin in 1908. After much labor, they turned the fort into “a place of beauty with flowers, shrubbery, a large formal flower garden, and a wild flower garden.” Acquired in 1950 by sisters, Susan, Elizabeth, and Ella Jordan, the last private owners of the property, the fort was later given to the Commonwealth of Virginia by will. The Isle of Wight Blues probably withdrew from Fort Boykin, May 8-12, they or the militia, leaving its flag flying. Sergeant Noah Pond, Surry Light Artillery, had the dangerous duty of blowing up one of its three magazines. The Isle of Wight Blues, 9th Virginia Regiment, Company E, would become part of Armistead’s storied Brigade, Pickett’s Division. Sergeant W. L. Turner, Isle of Wight Blues, related that he was in the hospital during the Gettysburg campaign and very few of his 9th Virginia companions returned. Isle of Wight’s James River Heavy Artillery, 3rd Virginia Regiment, Company K, at Fort Boykin from August through November 1861, and the rest of 3rd Virginia Regiment would become part of Kemper’s Brigade, Pickett’s Division. These companies were part of Pickett’s famous charge, 3 July 1863 against the Federals on Cemetery Hill at Gettysburg, Lieutenant Colonel Alexander Callcote of Isle of Wight being in command of 3rd Virginia Regiment for a brief moment before being killed. 3rd Virginia lost 36% of its soldiers. 9th Virginia Regiment was virtually destroyed suffering 75% casualties. The tramp and the rumble of Longstreet’s corps. Was a slip of a girl we’ll call her Jenny. On the steady flow of that steely river. In the flag she loved that her brothers died for. Armed with the stars and the sacred blue. Come on and take it the man who dares. Wanted to hunger and worn of weather. To death, failure, and fame forever. His tawny locks in the warm sun streaming. And never a finger was raised to fright her. To the charge that has won them the name eternal. The secret of faith in the foe’s forbearing. The stars in the fold of the blue again. Acknowledgements: The 2007 - 2008 interpretation of Fort Boykin owes much to the published works of Helen Haverty King, Lee A. Wallace, Benjamin H. Trask, and Benjamin Washington Jones. Helen Haverty King, Historical Notes on Isle of Wight County, Virginia, Donning and Company, Virginia Beach, Virginia, pages 536-541, 1993. Benjamin Washington Jones, Under the Stars and Bars. List of 173 soldiers, Company I, 3rd Virginia Regiment, James River Heavy Artillery, Captain Alexander Callcote, Commanding. Helen Haverty King, Historical Notes on Isle of Wight County, Virginia, Donning and Company, Virginia Beach, Virginia, pages 528 - 536, 1993. W. Thomas Smith, Quarterly Bulletin, Volume 25, No. 4, Archeological Society of Virginia, June 1971. Official Records of the Union and Confederate Navies in the War of the Rebellion, Series I, Volumes 6 & 7, Washington Government Printing Office, 1898. Lee A. Wallace, 3rd Virginia Infantry, H. E. Howard Inc., Lynchburg, Virginia, 1986. Benjamin Trask, 9th Virginia Infantry, H. E. Howard Inc., Lynchburg, Virginia, 1984. Benjamin Trask, 16th Virginia Infantry, H. E. Howard Inc., Lynchburg, Virginia, 1986. G. Howard Gregory, 53th Virginia Infantry and 5th Battalion Virginia Infantry, H. E. Howard Inc., Appomattox, Virginia, 1999. Robert B. Case, Andrew Talcott (1797 - 1883) – Robert B. Case, Virginia Beach, Virginia, October 1995. The Legend History and Archaeology of Fort Boykin In Virginia, Edited by Floyd Painter, The Chesopiean Archeological Association, 1982. The Encyclopedia Americana, Americana Corporation, New York, New York, 1942. Edwin Olmstead & Wayne E. Stark & Spencer C. Tucker, The Big Guns, Museum Restoration Service, Broomfield, Ontario, 1997. Richard P. Weinert, Jr. & Colonel Robert Arthur, Defender of the Chesapeake-- The Story of Fort Monroe, Leeward Publishing, Inc., Annapolis, Maryland, 1978. Virginia Engineer Department, Records, 1861-1865. Sig Cofer Dashiell, Smithfield – A Pictorial History, Donning Company/Publishers, Norfolk, Virginia, Pages 87-88, 1977. The link below is a MicroSoft PowerPoint SlideShow ... Click on the link to open (run) it, or RIGHT-click on it and select "Save Target As" to save it to your computer where it can be opened in the PowerPoint Program or with the PowerPoint Reader. USS William D Porter (DD579) ... "Don't shoot, we're Republicans"
A BIT OF HISTORY THAT YOU MAY NOT KNOW OF!!!!!! story, but only a smattering of newspapers took notice. of world history might have been quite different. of the fleet, the big new battleship Iowa . merely had a scraped anchor, but her career of mayhem and mishaps had begun. was watching his fast track career become side-tracked. Next, the fire room lost power in one of its boilers. explode shooting the torpedo out of its tube. Farragut's immortal 'Damn the torpedoes' figured centrally within. which unfortunately indicated it was headed in another direction. received and the Iowa began turning to avoid the speeding torpedo. now some thought that the Porter was part of an assassination plot. a weak, "We did it." thrown the used primer over the side to conceal his mistake. obscure shore assignments. Dawson was sentenced to 14 years hard labor. out for what was clearly an accident. this was as safe a place as any for the ship and anyone who came near her. she was re-assigned to the Western Pacific. commandant, thus rearranging his flower garden. ships, as many gunners, fearful of kamikazes, had nervous trigger fingers. made almost entirely of wood and canvas slipped through the Navy's defense. decided to let her crew off at the end. April is the month during which we recognize those who fought in the Civil War, Confedrate History Month. It has been estimated that at least 650,000 lost their lives in the War Between the States, also known as The Civil War. A well known historian and student of the War indicates that there is actually no way of knowing just how many lost their lives in the conflict but there could have been as many as approaching 750,000. No one will ever know exactly. Some of you receiving this e-mail are in some way related to the person described in it, Archibald Allen Redd. Many of you are not related but may find it interesting. 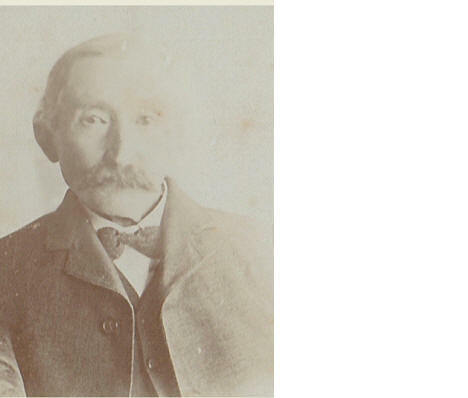 Archibald Allen Redd was born in Isle of Wight County on March 22, 1842. He died on July 31, 1920 at the age of 78. He is buried at the Colosse Baptist Church Cemetery along side his wife, Frances Cynifie Spivey Redd, near the main pathway through the center of the cemetery. Archibald Allen Redd was a brick mason by trade and was a Civil War Veteran. He served in the 41st Virginia Infantry and enlisted on 6-23-1861 at Cypress Chapel, Nansemond County, Virginia for 1 year. He was noted to be an illiterate farm laborer and was re-enlisted for War in March, 1862 and received a $50 bounty for re-enlisting. Archibald Allen Redd was wounded in action by a minie-ball in his right hand at Malvern Hill on July 1, 1862. He was in the hospital at Petersburg from July 16, 1862, and remained there until 10-9-1862. From March, 1863 to April 1863, he was at the CSA General Hospital at Farmville; detailed as a light duty hospital nurse, Howard's Grove, Richmond from May, 1863 through July, 1863; nurse, Jackson Hospital in Richmond from July, 1863 to September, 1863. Guard at CH 3 and 4 from 12-63 to 3-64. Transferred to Invalid Corp on 4-23-1864. Archibald may have had a brother namely Robert Redd (? ), a farm laborer, who enlisted on 6-23-1861 at Cypress Chapel. Medical Discharge 1-5-62 for chronic enlargement of liver and spleen and abdominal dropsy. 5 feet 3", brown eyes and dark brown hair. Another possible relative of Archibald was one Alfred Redd. Alfred was with the Beaver Dam Avengers. He enlisted on 8-28-1861. Teamster to Div. Train- captured at Burgess Mill. Sent to Pt. Lookout, Maryland 10-31-1864. Exchanged 2-10-1865. Member of Mahone's Brigade. Died 6-18-1889 in Isle of Wight County. 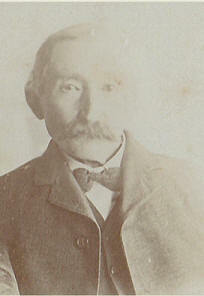 Husband of Angeline Redd (1821 to 1903 or 1904). Alfred and Angeline (Ann) Spivey Redd were the parents of Indiana Redd Spivey. Indiana Redd Spivey was the husband of Irvin Exum Spivey. Indiana (Anna) and Irvin Exum Spivey were the parents of Ruth, Alfred and Lud. 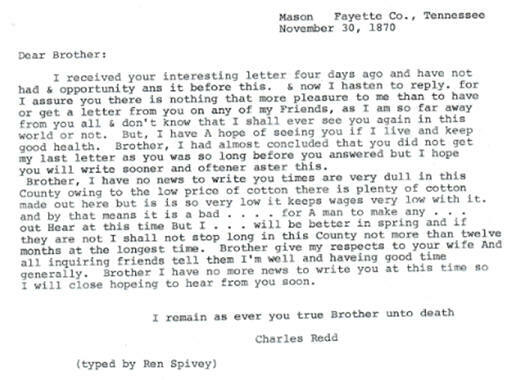 Archibald Allen Redd also had a brother named Charles Redd who wrote a letter dated November 30, 1870 addressed from Mason Fayette Co., Tennessee. According to Leona Redd Spivey, Charles also served in the Civil War but nothing was ever heard from him by the family following his writing and sending said letter addressed to "Dear Brother" to Archibald. A typed copy of this letter transcribed from the original handwritten letter is attached to this writing. A picture of Archibald Allen Redd is also attached to this writing. Archibald Allen Redd and Francis Cynifie Spivey Redd had the following children: Charles Cephas Redd, Benjamin A. Redd; John A. Redd and Dosia Redd Ballard. Archibald Allen Redd and Frances Cynifie Spivey Redd lived in a house which is still standing. It is located on Little Norfolk Road and was later occupied by Guthrie and Alma Ballard. The house is now vacant and in disrepair. Frances died in 1930, some ten years after Archibald. Her half sister, Indiana Redd Spivey also died in 1930. Note: It is noted that according to Leona Virginia Redd Spivey, one of Frances' grandchildren, Frances was raised by one Blake Spivey. I have no other information about who Blake Spivey was. Note: Other Confederate Veterans buried at Colosse Baptist Church Cemetery are: Elisha Carr; Spencer Carr; Mills Babb; Irving Jenkins; J. P. Rhodes; James Parker; John Coggin; James Rhodes; Samuel Turner and James Crumpler. This gives anyone interested a little more insight into some of the history of Archibald Allen Redd, some things he did and what he looked like. We all should honor him as a soldier who fought for that in which he believe. The above article was made on April 26, 2014 by Lud Lorenzo Spivey, Great Great Grandson of Archibald Allen Redd ... We can only imagine what war is like. The men listed above saw it first hand. May it never happen again. Commonwealth of Virginia manuscript document (DS), twice signed "Andw Woodley" 7.75 x 8, dated July 1813, detailing the use of seven slaves and an ox chain for constructing a blockade across Pagan Creek, successfully preventing the British from invading Isle of Wight County as payment to a plantation owner by the Commonwealth of Virginia. In August of 1619, slavery was first introduced in Jamestown, one year before the Pilgrims landed. The practice grew at a rampant rate throughout the agricultural South, and the status of "slave" quickly became legally recognized. It would take over 200 years of bloody revolts, legal acts and finally, the Civil War, until the Thirteenth Amendment was passed in 1865, officially abolishing slavery and acts of involuntary servitude. Document reads, in full: "1813 July. The Commonwealth of Virginia. To Andw Woodley --- Dr. For 2 ox Chain 6 feetlong. 48th @1/. $8.00. 15 days work of 3 Negroe Men 5 days each 2/3 5.63. 16 days work of 4 Negroe Men 4 days each d[itt]o 6.0. [total] $19.63...do Certify that the Chains was had for the purpose of throughing a Boom a Cross Pagan Creek & the labour was perform in throwing up a brest work and assisting about sd. Boom during our last or 2nd Invation of the Enemy by order of the Commanding officer. Old Town. Andw. Woodley." A "Boom" was a chain of connected floating timbers serving to obstruct navigation. The Boom was successfully thrown across Pagan Creek by seven of Andrew Woodley's slaves. According to the 1810 Federal Census, Andrew Woodley had 49 slaves. On June 26, 1813, the British launched an attempt to enter Pagan Creek, Isle of Wight County, Virginia, but were turned away by U.S. artillery and infantry. In fine condition, with slight separations at the edges of folds, repaired on verso with glassine.